WhiskyIntelligence.com » 2014 » February - whisky industry press releases, newsletters, events, tasting notes, bottlings and comments. Frankfort, Kentucky – January 30, 2014 – Beam Inc. (NYSE: BEAM), a leading global premium spirits company, today announced that its new state-of-the-art distribution center will be located on a 92-acre site in Franklin County at 1509 US Highway 421 (Leestown Road). Spanning 600,000 square feet upon completion, equivalent to 13 football fields, this facility will be the largest of its kind in Franklin County. Construction is expected to commence in late February and be completed by year-end. The new center, which will be operated by a third-party logistics provider to be named at a later date, is slated to open in the first quarter of 2015 and employ an estimated 60 individuals. It will exclusively serve Beam’s broad portfolio of distilled spirits brands and will warehouse Beam’s finished case goods bottled in Frankfort before they are shipped to distributor partners for sale in the U.S. and international markets. “Beam is such a strong business partner and contributor to our community, and we couldn’t be more pleased that they have chosen to further expand in Franklin County,” said County Judge Executive Ted Collins. H&M Construction Co., Inc. has been hired as the contractor to design the building, develop the site and build the facility from the ground-up. This announcement is the latest in Beam’s long history of business investments in the Commonwealth. Last year, Beam opened its new Global Business Services Center, reflecting a $2.7 million investment that has brought more than 30 professional jobs to Louisville. In late 2012, Beam opened the Jim Beam American Stillhouse visitors’ experience and Global Innovation Center, a combined multi-year investment of $30 million, in Clermont, Ky. Beam currently employs more than 900 people throughout the Commonwealth in Louisville, its Global Innovation Center in Clermont and at its manufacturing plants in Loretto, Frankfort, Clermont and Boston. As one of the world’s leading premium spirits companies, Beam is Crafting the Spirits that Stir the World. Consumers from all corners of the globe call for the company’s brands, including Jim Beam Bourbon, Maker’s Mark Bourbon, Sauza Tequila, Pinnacle Vodka, Canadian Club Whisky, Courvoisier Cognac, Teacher’s Scotch Whisky, Skinnygirl Cocktails, Cruzan Rum, Hornitos Tequila, Knob Creek Bourbon, Laphroaig Scotch Whisky, Kilbeggan Irish Whiskey, Larios Gin, Whisky DYC and DeKuyper Cordials. Beam is focused on delivering superior performance with its unique combination of scale with agility and a strategy of Creating Famous Brands, Building Winning Markets and Fueling Our Growth. Beam and its 3,400 passionate associates worldwide generated 2012 sales of $2.5 billion (excluding excise taxes), volume of 38 million 9-liter equivalent cases and some of the industry’s fastest growing innovations. P/O/U/R/S = Peaty, Old, Unusual, Rare and Sherry cask matured. Recently many people have requested the exact nature of the line up at the ‘pours’ tastings remain secret so a proper ‘blind’ tasting can be held. However I understand some attendees would be more comfortable knowing which drams were to be tasted before committing to attending. If you don’t want to know the confirmed line up contact us before checking the details listed below. * = £3 discount for first timers and members. Membership costs £10 for 13 months. Glentauchers 15yo cask strength sherry cask bottled by Gordon & MacPhail for The Whisky Exchange – a true sherry monster, not for everyone but very much for me. Longrow 7yo October 2000 – January 2008 5 1/2 years in refill Bourbon then 1 1/2 years fresh Gaja Barolo 55.8% 12120 bottles. I love this stuff, the flavour just keeps on going. Marie Curie fund raising tasting Thursday 27.3.14 £25 – 100% of money taken goes to the charity SOLD OUT! Those whisky daft Danes are back with the usual request – pour the 5 best drams Cadenheads currently have – hang the price. This Spring brings with it our first new release of the year – the limited edition 17 year-old Single Malt. This bottling is limited to 9,000 bottles worldwide and follows in the footsteps of our limited 16 year-old released last year. 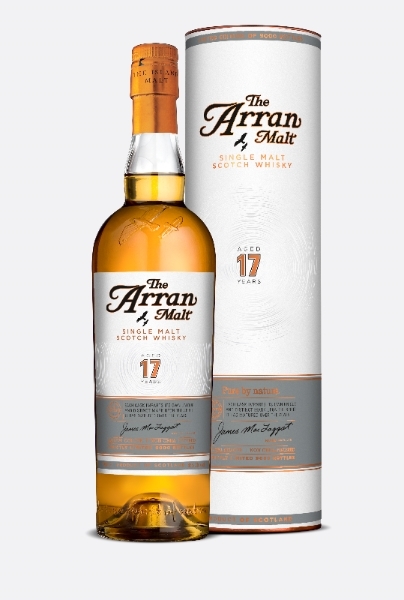 These are exciting times for the Arran team as we step ever closer to our first official 18 year-old. This edition is made from 100% Sherry Casks and the advance tasting note can be found exclusively in the White Stags section of our web site. Come and see what’s going on with the White Stags here. Many of you will not want to miss the long-awaited third and final instalment of The Devil’s Punchbowl Trilogy which will be arriving with us at the end of June. You will find it first on our web site and it looks like being a heavenly end to this fantastic series. THE START of a new year brings a new limited edition GlenDronach single malt designed for the serious connoisseur. 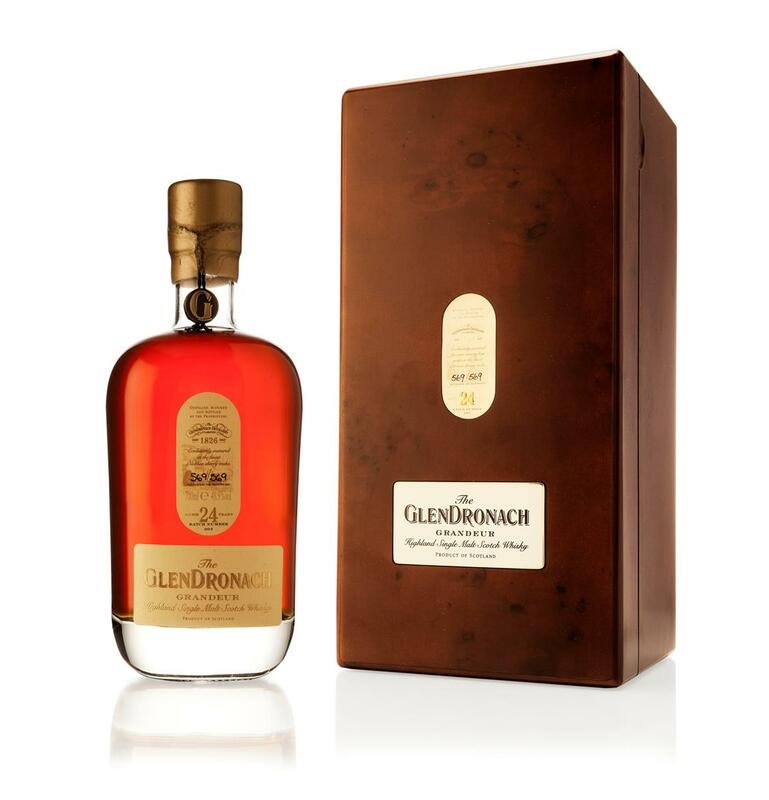 Replacing the GlenDronach Grandeur 31 Years Old that has now sold out, the GlenDronach Grandeur 24 Years Old is another exquisite long-aged representation of the smooth, complex and full-bodied style for which GlenDronach Distillery is justly famous worldwide. For if the glorious rum-soaked golden sultanas don’t capture you as you savour it for the first time, you’ll definitely be ensnared by the dark chocolate and zesty orange oil softening to a deep clove spice. The Grandeur 24 Years Old, at 48.9%vol, shows the finest sherry oak casks, masterful maturation and traditional crafted Highland single malt in perfect harmony. Lovingly aged for almost a quarter of a century and beautifully gift-boxed, this exceptional whisky has been specially selected by Master Distiller Billy Walker from some of the oldest and most unique Oloroso sherry casks at GlenDronach. This bottling, batch number 4 of the Grandeur releases, is limited to 569 bottles. Individually numbered by hand, each bottle is a one-off and truly unique, making it a very special and remarkable malt. Billy Walker’s tasting notes demonstrate that the Grandeur 24 Years Old is indeed one of the greats. Nose: A magnificent combination of honey-drenched dates and succulent raisins which gently ebb and flow with waves of delicate orange blossom, mint and cracked black pepper. Hints of glazed cherries and toasted almonds perfectly complement the seductive nose – a nose to be appreciated slowly and often. Palate: A fabulously full-bodied, vibrant palate captures a multitude of classic sherry cask characteristics. The delicate sweetness of rum-soaked golden sultanas refines rich espresso, dark chocolate and treacle toffee. Zesty orange oil softens to a deep clove spice and prolongs the ever-changing palate. A sublime example of understanding the relationship between cask and single malt perfectly. Conclusions: The Grandeur 24 Years Old encapsulates the perfect harmony of exquisite sherry oak casks, masterful maturation and traditional crafted Highland single malt. A dram to be savoured in order to reveal the depth of dramatic flavours held in the glass. A truly memorable and captivating GlenDronach expression. The brand new limited edition GlenDronach Grandeur 24 year old is now available to order via The Whisky Shop. Only a limited amount of bottles are available so all orders will be dealt with on a strictly first come first served basis! The GlenDronach Grandeur 24 year old has been matured exclusively in Oloroso sherry butts and is one of only 569 bottles which have been bottled at a natural cask strength of 48.9% volume. Finish: The Grandeur 24 years old encapsulates the perfect harmony of exquisite sherry oak casks, masterful maturation and traditional, crafted Highland single malt. A dram to be savoured in order to reveal the depth of dramatic flavours held in the glass. A truly memorable and captivating GlenDronach expression. A new malt distillery for the Isle of Skye is announced today, Wednesday 19th February 2014. The new distillery – only the second on the famous Hebridean island – will be created within a listed early nineteenth century farm steading at Torabhaig on Skye’s southeast coast. The Torabhaig Distillery will cost more than £5 million and is likely to employ around eight people. Torabhaig Distillery Limited is a subsidiary of Mossburn Distillers Ltd. Outlining the company’s investment plans Neil Mathieson, Chief Executive Officer of Mossburn Distillers Ltd said: “Torabhaig is our first entry into the Scotch Whisky category and a very important starting point. “Skye is renowned all over the world for its natural beauty and cultural heritage and we believe that Torabhaig will be a valuable contribution both to whisky distilling on Skye and to the island’s continuing attraction to international visitors. The Torabhaig site formed part of the late Sir Iain Noble’s lands of Fearann Eilean Iarmain. Sir Iain’s widow, Lucilla Noble has been invited to join the Board of Torabhaig Distillery Limited. The detailed specification of the new distillery has yet to be finalised but will include facilities for visitors. Plans for Torabhaig are being created by Edinburgh architects Simpson & Brown, a specialist partnership responsible for conserving some of the United Kingdom’s most important historic structures as well as designing award-winning contemporary buildings. Planning consent has been granted for Torabhaig and it is expected that construction work will begin in the early summer. It is anticipated that the first new spirit will flow from Torabhaig by the end of 2015. 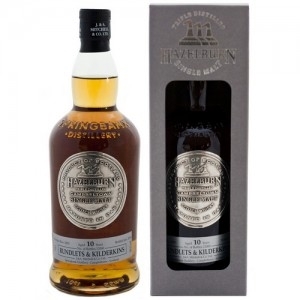 Hazelburn 10 Year Old Rundlets & Kilderkins is the third and final release of the series from Springbank distillery matured in small 15 & 18 gallons casks. You are currently browsing the WhiskyIntelligence.com blog archives for February, 2014.